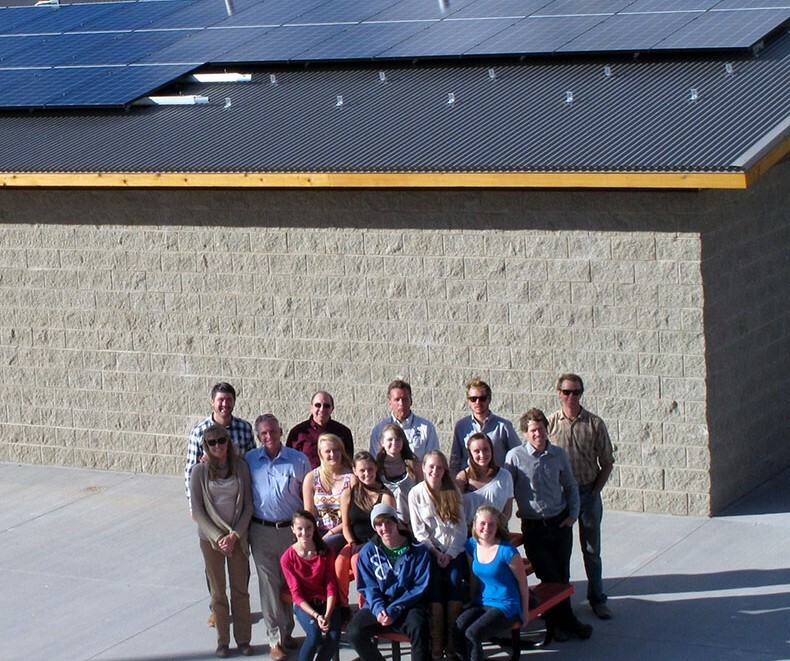 In less than six months and right on schedule, Students for Sustainability (SfS) completed phase one of its solar initiative at the Jackson Hole High School (JHHS) sports complex. Creative Energies, a local private company, installed the system, and the JH Energy Sustainability Project funded it. This remarkable achievement was recognized at the October 19th Broncs’ football game against Star Valley. With 48 solar panels and two inverters, the 11.76 Megawatt system will fully offset the energy used by McIntosh Stadium’s high voltage lights and scoreboard for many years to come. SfS is a student run-group based at JHHS; Alan Brumsted is faculty adviser. Along with the JH Energy Sustainability Project, IC 21 counsels SfS on how to best achieve their mission of creating tangible change through conservation, energy efficiency, and analysis that then educates the student body and community. Currently the club is using light and wattage meters and temperature/humidity sensors to measure energy consumption at JHHS in hopes of initiating a major energy reduction campaign. This spring, it will begin work on phase two of the solar initiative, aiming to add a second solar array at McIntosh Stadium to offset the total energy consumption of JHHS sports complex’s and save the school district $1500-$3000 annually.